The beauty of going upside down is a fresh perspective. For many of us, however, going upside down can seem pretty intimidating. One of my favorite ways to teach people to go upside down involves the aid of three yoga blocks and a wall. It’s fun, supportive, and a lot less scary than attempting a headstand or headless headstand in the middle of the room. 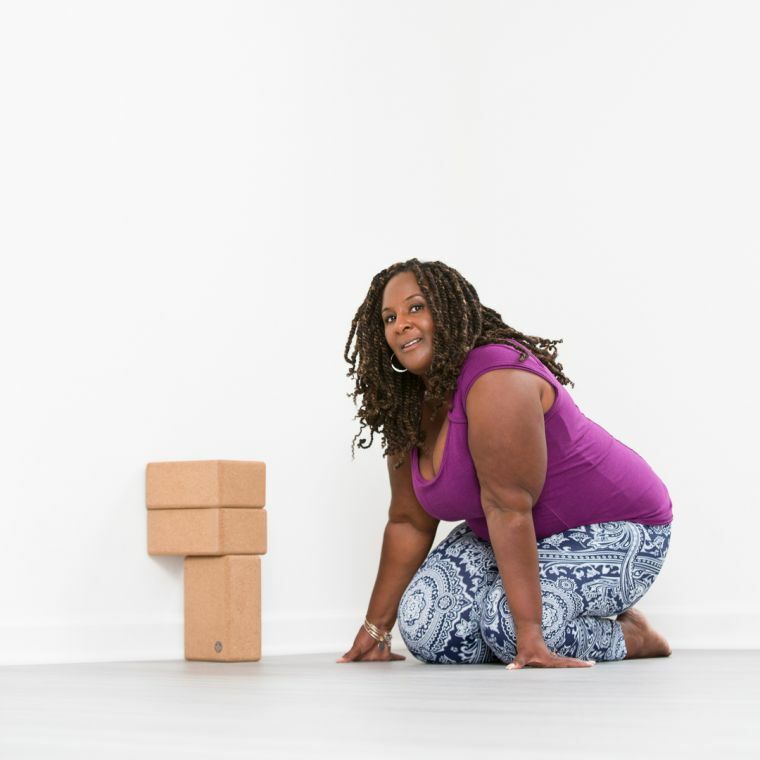 Practicing with the blocks allows you to remain supported and to gradually work toward moving your feet away from the wall. One of my favorite ways to teach people to go upside down involves the aid of three yoga blocks and a wall. If you’re practicing at home, make sure you practice by a wall in a big open space with nothing directly behind, beside, or above you that could obstruct your inversion. To set up, first place the short edge of your yoga mat against the wall. Next, set up your three blocks so they can support your upper back: Put the first block about an inch or so away from the wall, with its tallest and most narrow side facing the wall. Then stack the other two blocks on top of the first—both at their lowest heights, with their shortest ends flush with the wall. (I like to call this a “Stonehenge setup.”) Note that while the top two blocks are touching the wall, there’s a space between the bottom block and the wall. Begin on your hands and knees in front of the block setup. Then, come onto your forearms and wrap your fingertips around the bottom block. Make sure your elbows are underneath your shoulders. Bring the back of your head to touch the bottom block (the crown of your head can either rest lightly on the floor, or for a headless headstand, hover completely off the floor). Tuck your toes under, and lift your knees off the floor—as you would if coming into downward facing dog or dolphin pose. Then, walk your feet forward (toward the wall) until you feel your upper back supported by the blocks. Before continuing, press a ton of weight into your forearms (as if you’re pushing the floor away from you) so that there’s no (or very, very little) weight on your head. From here, lift one leg and float up, bringing both of your heels to touch the wall. Pull the bottom block toward you to press the other two blocks against your back for support. Continue to push the floor away with your forearms so that there’s little or no weight on your head. Once you find your balance, you can bring your feet away from the wall. To do so, hug your legs together, and reach up through your heels as you push down into your forearms. When you’re ready to come down, simply draw one knee into your chest, and momentum will bring you down gently. And voila! You’ve got a beautiful and accessible inversion!